BeenThere-DoneThat: The Rollright Stones, Oxfordshire. 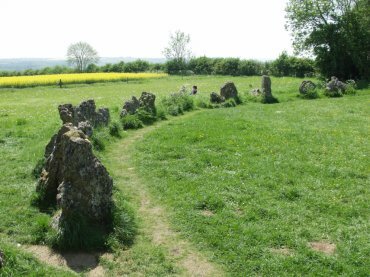 Located a little north of Chipping Norton the Rollright Stones consist of three parts - the King's Men Stone Circle, the King Stone and the Whispering Knights. This picture shows the whole of the King's Men Stone Circle. 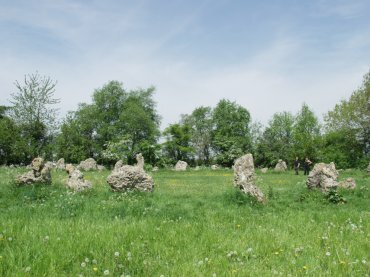 This stone circle is 104 feet across and is set in the corner of a field. The figures give an idea of scale. There is free parking in a lay-by at the side of the road at the entry point to the stones and there is a small entry charge (£1.00 each in 2008). The King's Men Stone Circle. 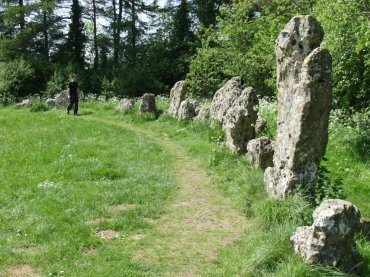 There are 77 stones in the King's Men Stone Circle which dates from late Neolithic times and is about 2,500 years old. Legend has it that the King's Men come to life at night and go down the hill to drink at a spring at Little Rollright spinney. The individual stones, as you can see, vary considerably in size from about knee height to above head height and are slowly being weathered away. There is another part to this collection of stones called 'The Whispering Knights' which is situated lower down the slope.These are actually the remains of a 5000 year old burial chamber, believed to be part of a Neolithic long barrow. The Rollright Stones - The King Stone. 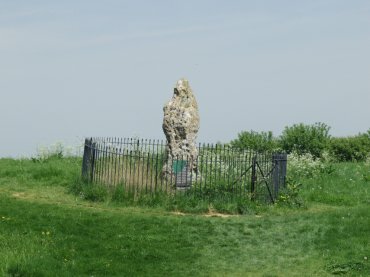 This monolith stands across the road from the stone circle and is actually in Warwickshire (the county boundary runs along the road). Its purpose and age are unclear although it is believed to be of middle Bronze Age origin. Some sources suggest that it might be an outlier to the Stone Circle.